I’m trying to make a concerted effort to eat less meat. It’s expensive, most studies show that eating a lot isn’t particularly good for you and I’ve got issues with the whole industry. Around the time that I started this blog I started cooking for scratch much more than I did before and I also started batch cooking. The trouble is, most of my batch cook recipes are meat based and I have trouble thinking up vegetarian ‘batch-cook-and-freeze’ options. I made an ok vegetarian lasagne last month and some veggie pasta sauce but it wasn’t great. I’m not going vegetarian…I’d just like to be think up some more meat free meals without replying on pasta too much. The large bag of red split lentils was £1.99 (my second ever bag of these!) 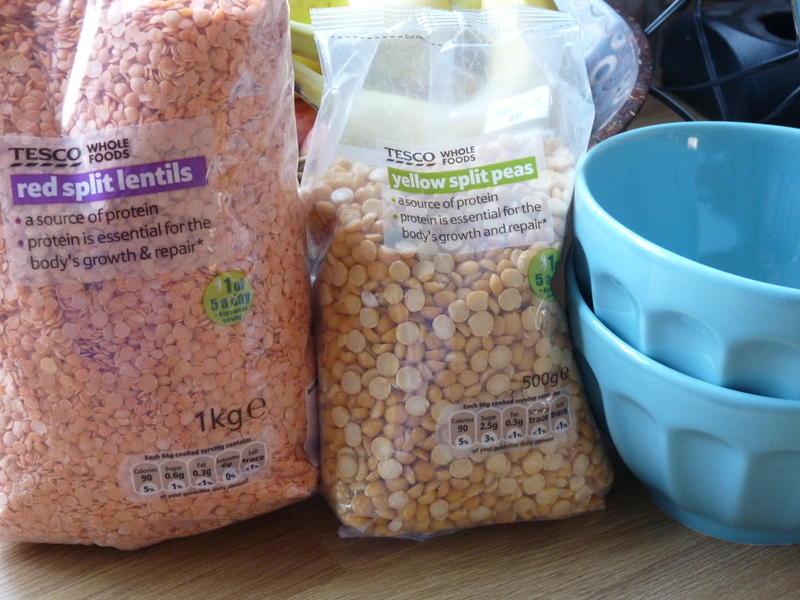 and the yellow split peas were 49p (my first ever bag!). I thought that a vegetable stew made with the peas and / or lentils would make quite a substantial, nutritious meal. I’m not sure what the other members of the household will make of it but even if just I like it I’ll consider it a ‘win’. If anyone has any ideas for ways to use these (or other tasty meat free – preferably freezeable – recipes) please let me know! Is the fairy cake the baking world’s equivalent of the red squirrel? Has it been driven into near extinction by the increasingly dominant cupcake? I love cupcakes and I have made them many times. I even have the special, deeper tins and the larger cupcake/muffin cases. I love making cupcakes from the Hummingbird Bakery recipe book (one of my all times favourites). And yet, the fairy cake wins my vote every time. They are smaller (thus better for waistline and teeth) and require less ingredients (thus better for the purse). And they are so dainty and traditional! All of the birthday parties of my childhood were not of the ‘book a hall or novelty act’ variety but the kind where there were sandwiches and fairy cakes laid out on the kitchen table and a party mix playing in the background where everyone would play musical statues and pass the parcel. 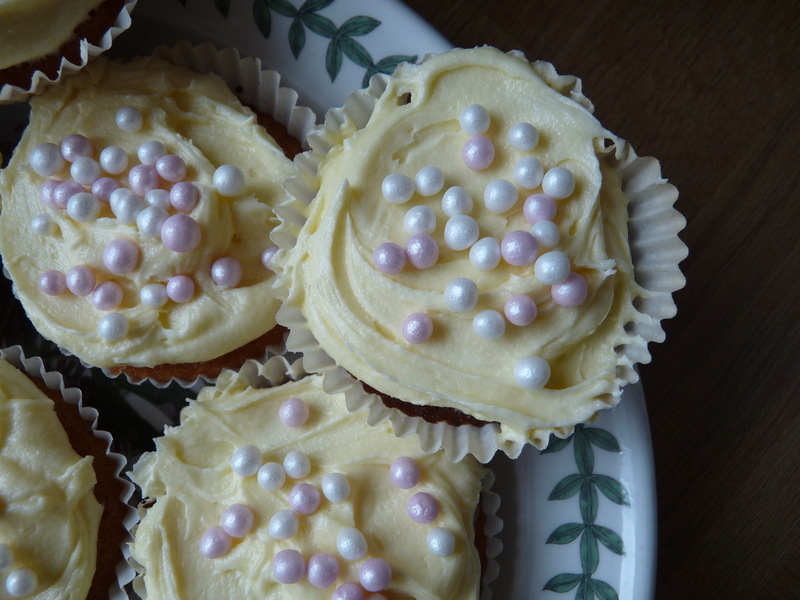 They were brilliant and fairy cakes still epitomize that sense of fun for me. I topped these with naughty but very nice butter cream icing and some pretty, pearly sprinkles that were reduced. We were nearly out of sprinkles (one of my daughters favourite parts of the cake making process and therefore critical) and I spotted these Dr Oetker sprinkles reduced from £1.29 to 97p. Their sell by date isn’t until September so I’m sure they’ll all be used up well before then! I like to use this lovely Portmeirion plate for cakes – I love seeing the circle of green leaves peeking out around the edge. About 12 years ago a colleague and his wife were having a clear-out and gave Husband and I (who had just bought our flat and were young and broke) a massive stack of old crockery. In turn we’ve passed it on to friends just starting out but we’ve hung on to the three pieces of Portmeirion that we were given. My colleague, who was also a friend and something of a mentor, died nearly ten years ago. I think of him every time I use them. The above takes me less than 5 minutes. I’m fussier/more likely to use the food processor when mixing more ingredients, as with a larger cake. However, for fairy cakes I like to use a bowl and a spoon as I find it easier and also because my daughter has fun mixing with a spoon (and licking it afterwards). Put 12 paper cases on your cake tray (preferably the kind with 12 ‘dips’) and spoon the mixture into the cases. Pop into a preheated oven for 15 minutes at Gas Mark 5. Sometimes we eat them plain but we usually go for the icing/sprinkles option! How about you – do you still rock the fairy cake or do you cupcake? One of the things I was most excited about when we bought this house was the cupboard in the hall. The lady that lived here before had it set up as a kind of walk-in cleaning cupboard. There were a few shelves and some bags hanging on the wall full of carrier bags and odds and ends. As soon as I saw it I knew exactly how I’d use it if it were mine. When were in the process of buying we had the usual list of bits and bobs the vendor might like to sell for a bit extra. We hardly bought anything but we did buy the under-counter freezer that she had in the kitchen. It looks like new and we only paid £10 for it. Since I already have a fridge-freezer this has doubled my freezing space. The day we moved in one of the first things we did was to shuffle the freezer from the kitchen into the cupboard in the hall. It’s great to have an extra freezer in a place that is easy to access and out of the way all at the same time. The freezer fits nicely under the three shelves which had been covered in the same minging wallpaper that we currently have in the spare room. Lovely isn’t it? 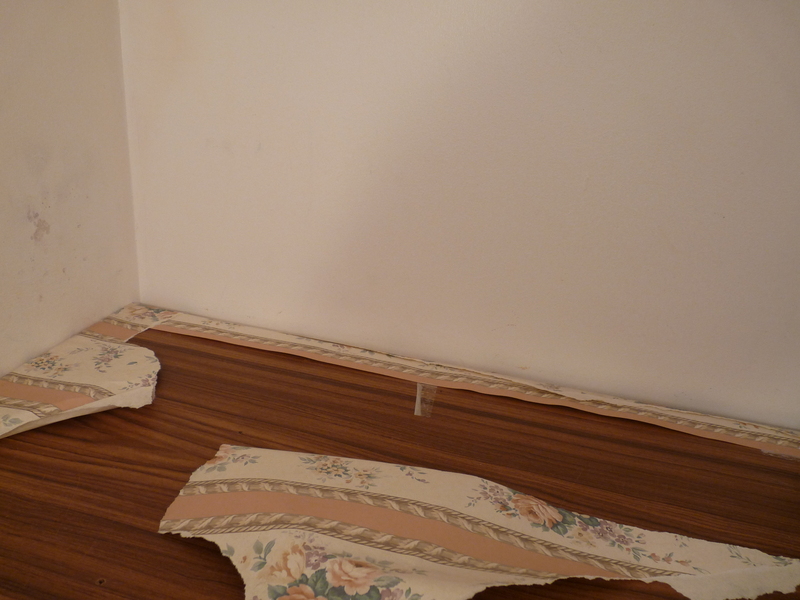 This weekend I ripped all of the wallpaper off and properly sorted the content of the shelves. Ta da! As you can see, I’ve now got plenty of room to do a bit of bulk buying if I see a good offer on. I caved in this morning and went to Tesco. I had been dithering about whether to go since I had a ‘£5 off a £40 shop’ voucher. We were desperately low on some of our staples (and completely out of cling film, clothes wash and that type of thing) but I also didn’t want to spend any more money until the end of the month when I would release our new food budget for April. In the end I decided that it would be better to take money out of the budget a bit early to make the most of the offer – it seemed daft to miss out on saving £5 just for the sake of buying them 6 days early. It also means that I don’t have to do a big shop during Easter Bank Holiday weekend just when the supermarkets will be heaving. Tesco had their 3 for £10 offer on meat so I bought £20 worth. I ought to be able to make that last the whole month. I need to do a bit of an inventory to see exactly what I’ve got and make sure I’m using everything up. I would have done it this afternoon but we had friends over for tea and cakes this afternoon which was much more fun! Must stop baking though. I’m expanding at an alarming rate . I’ve got a seriously domestic weekend planned. The weather is still awful and it’s been an unusually long and tiring week. My daughter seems to be coming down with something and could probably do with a bit of quiet ‘home’ time. I know I could. Yesterday afternoon I gave the bathroom a good scrub down and I also tidied, dusted and polished the two bedrooms. There is a third room upstairs which technically is a bedroom but in actuality is a junk room. I don’t know how I lived without one for so long. Don’t know what to do with it? Chuck it in the spare room! It currently houses a wardrobe, a folded up camp bed, a mattress for the camp bed, our old dining room table, the now redundant cot, about 50 books, every photo album we’ve ever owned, a child sized tent and who knows what else! One day I will sort this room out properly. But not until our bedroom has been decorated at least. Anyway, junk room aside the whole of upstairs has been thoroughly cleaned, hoovered and aired. Today I have tackled downstairs. I’ve tidied and dusted the living/dining area, a wipe down and tidy up of the kitchen and a hoover. The hall also had to be tidied as I still haven’t worked out where to put coat hooks. I’ve also given the front porch a bit of a sort out and managed to wedge a small piece of furniture out there that was taking up space (and was inaccessible) in the hall. 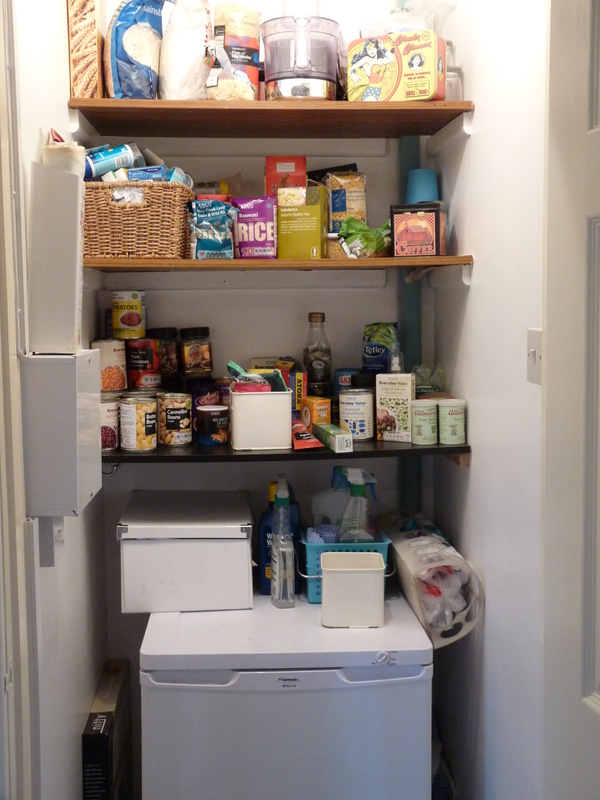 I’ve also sorted out the pantry which I’ve been meaning to do pretty much since we’ve moved in. Depending on my frame of mind I either love or loathe housework. Since I’m in a domestic frame of mind at the moment I’ve quite enjoyed doing it – particularly as I got the most time consuming bits done yesterday. It feels good to have got so much done. 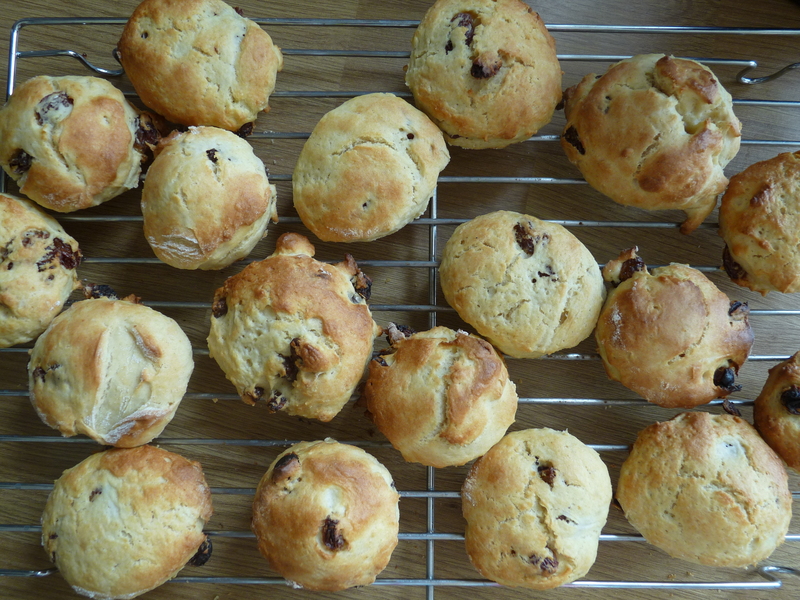 My daughter and I made another batch of fruit scones (I doubt there will be any left by bed time but hey-ho) and we’re planning to make some bread rolls this afternoon. I have two packs of bread mix and they need using up! Particularly since we ate the last of the bread this morning. Selected cheese is 3 for 2 in Tesco at the moment. Last week I bought the Value mozzarella as part of the offer. I was impressed that it’s usual price is only 44p. I’m going to make pizza for dinner with sweet potato ‘fries’. Nom. My big plans this evening involve a bowl of home popped popcorn (but only if I break my pact not to leave the house) and our Saturday occasional treat of a movie on iTunes (new releases are usually around £4). It couldn’t be better! Isn’t the weather AWFUL? When I got home today (for the second time) I declared that I am not leaving the house again until I have to go to work on Monday morning. I might have to go back on that though, since I really fancied getting some proper DIY popcorn this weekend! And I might nip down to the local carpet shop to eye up what they’ve got for our bedroom. But you get my point! I’ve been talking to a couple of different people this week about how safe you feel when you go out and about. Before I was a parent I’d walk almost anywhere by myself. There are a few spots in our locality where I’d have felt a bit too isolated but generally I was happy to bod off by myself for a walk. Now I’ve got my daughter I’ve become really aware of how vulnerable we are when it is just the two of us. It is quite frustrating to live in a place where we are surrounded by countryside (free to roam in!) and yet not to feel safe enough to go out in it! Husband only has one or one and a half days off a week, the weather is usually ropey and he doesn’t always want to go walking. I just don’t feel safe enough to go on many local walks apart from going around town and along the seafront. Sad isn’t it? It’s blinkin’ hard trying to run when you are carrying a toddler. We wouldn’t stand a chance if something happened. A friend of mine realised this when she was in a park with her two kids and couldn’t tell if a man was following them or not. She was grateful when it started to rain so she had a ‘legitimate’ reason to grab the kids and run to the car. I’ve been shopping for clothes at home this week. My weight still hasn’t stopped lurching through the endless cycle of ups and downs that started when I had my daughter nearly three years ago. I’ve somehow managed to put on over half a stone in the last month or two. Don’t ask how – I’m eating the same things in the same way I always do! Anyway, I’ve been avoiding certain clothes because I know they will ride up or make me self conscious so I thought it was time for a sort out. In our new bedroom we have a large fitted wardrobe (hooray!) and I have two rails for hanging tops. I quickly went through the rails and put all of my tops in a larger size on the top rail and all of the ones that are currently a bit too small on the bottom rail. It took less than five minutes but it was so much easier getting dressed this morning! They aren’t all my favourite clothes but at least I don’t feel uncomfortable and self conscious in them. I have no doubt I’ll manage to ease my weight back down again over time but at least I’ll look a bit better while I’m trying to get there! I’ve also been oggling a few blogs and websites that have really made me want some new clothes and accessories. However, I’m not buying anything this month as I’m trying to put a bit extra back and I wouldn’t even know what size to buy them in! So, it was back to my old trick of rustling through my various boxes and drawers of accessories to see if I could find anything that I had forgotten about. As I had already done this fairly recently I didn’t come up with much but I did stumble upon a three tiered necklace with turquoise beads which I bought in Sainsbury’s (of all places) a few years ago and never really wore. There seems to be quite a bit of turqouise and mint green around this Spring so I’ve put it on my necklace stand to remind me to get some wear out of it! 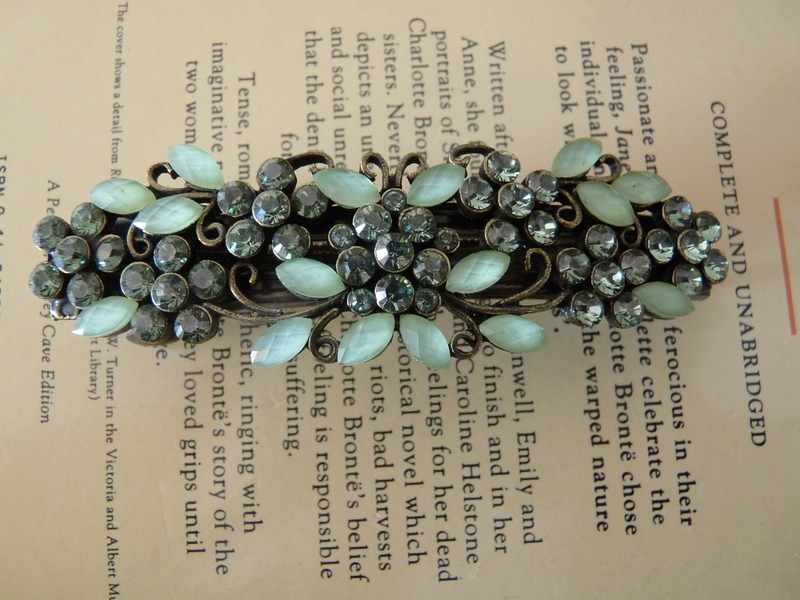 Speaking of mint green, I also found the hair clip pictured at the top. Pretty, isn’t it? I bought it in Accessorize more years ago than I can remember. For some reason I’ve never really worn it. I’m wearing it today as it goes with one of my ‘larger’ size tops which has tiny little flowers in the same colour printed all over it. My daughter was most impressed by it – I think she’s only ever seen my hair tied back with blonde coloured hair bands! And there you have it – a totally free shopping trip! I had a plan today. 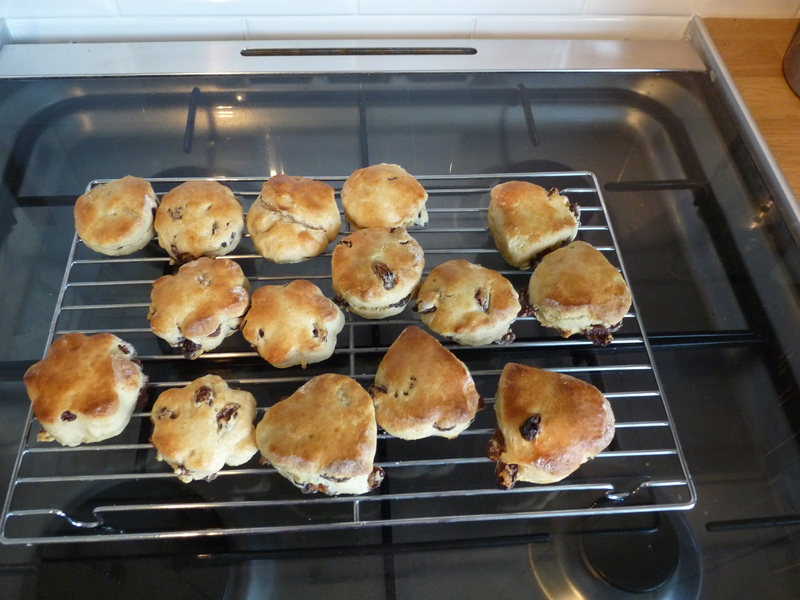 I thought I would make scones, freeze them and then take them out one by one to supplement Husband’s packed lunch. 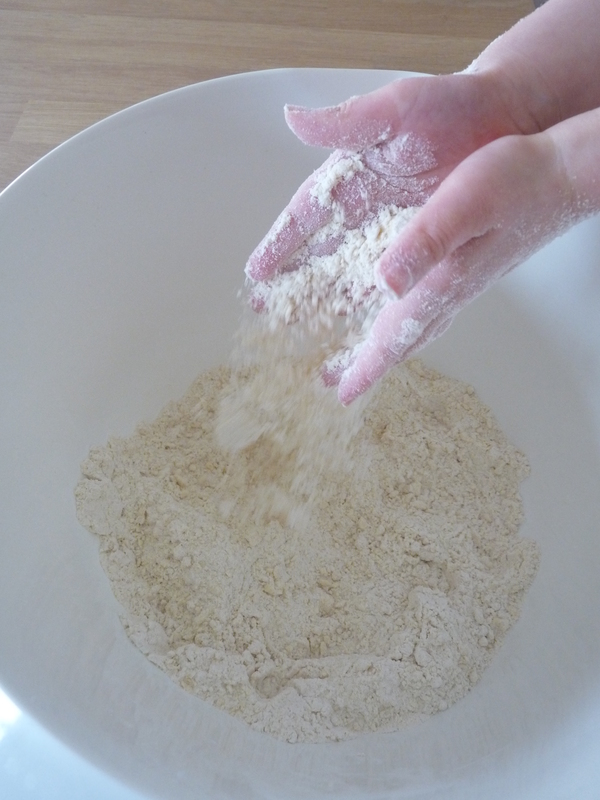 My daughter loves any kind of baking session – particularly anything involving kneading and cutting shapes so scones seemed like a win all round. What actually happened was that we made scones and then ate scones. Nearly all of them. Oops. I don’t think I’ve actually made scones before. I’m not sure they were quite right. The mixture was very sticky as though it had too much moisture in it and they didn’t seem to rise. That said, they tasted wonderful so I’ll definitely be making them again! So, that’s what’s going on in the kitchen. What about our finances? My main financial goal this year is to establish some joint savings. Now we’ve moved house our monthly expenses are much higher and I’m still only earning a part time wage. Husband and I each pay a set amount into our joint account on each of our pay days. Savings are built into this figure. We save £50 a month for ‘Gifts’ (birthdays, Christmas, cards, wrapping paper, postage and all that jazz), £50 a month towards car tax and maintenance and then we have some left over which we then get to decide how to use. Last month we had to pay for several rounds of emergency dental treatment and medication for Husband. Sometimes we use our ‘savings’ to pay for a one-off bill or for something we need for the house. It also gets dipped into when I haven’t been able to stay within the food budget (which happens all the time now – I need to either get to grips with this or accept that my budget needs to be increased!). It will also the source of funds for continuing our renovations once the ‘profit’ from the sale of our flat runs out. Before that happens I would like to get us to the point where we have £1000 in a savings account and a further £500 in an easy access account for all of the smaller expenses that crop up – like the dentist appontments or the previous month when we paid an engineer £40 to mend our washing machine (much cheaper than buying a new one!). Hello! Long time no speak. I’ve decided to return to my homeground after dithering around with other ideas in other places. I am very cautiously going to say that the security hazard is now at a reasonable distance. Reasonable enough that I think I might just be able to come ‘home’! How are you doing? It’s been a crazy few months since I last posted here. In that time we actually moved house. Yes – us! Those people that had been stuck in the nightmare flat situation for 5 long years. The light at the end of the tunnel got bigger and brighter until we popped out dazed and delighted at the other end. Phew. Also – by a wild stroke of luck and fortune – the sale went through on the aforementioned flat so we didn’t have to go down the buy-to-let route. I KNOW. How lucky are we? Okay, we lost a lump-in-the-throat amount of money in arrangement/early repayment fees for the BTL mortgage. However, we don’t have the worry and stress of being responsible for another property (one that had a LOT of problems) and finding tenants, getting rent paid etc. AND got a decent price for it so we could put a bigger deposit down and have some left to do the most important renovations on our new house. I know, I know. Seriously lucky. We feel like all our Christmasses have come at once. We’ve already had the biggest piece of work done which involved having a wall knocked down and a new kitchen put in. Husband did a huge amount of the work himself (taking the tiles off, ripping the kitchen out, plastering, laboriously doing trips with it all to the local dump so we didn’t have to pay for disposal). It was a complicated project to manage with pipes having to be sunk under the floor, electricians in and out and floors having to be levelled, not to mention the kitchen fitting and demolition! Having to live in an open plan building site with a toddler for over a month was the opposite of fun. However, it has all been worth it and I’m glad that we’ll get the benefit of our work right from when we arrived here. We’re planning to stay a long, long time. Living in this house is…amazing. So much space! And, don’t forget, I am talking about a very plain, ordinary 3 bed semi here, not a mansion. But after living in such a cramped space for so long it is utter bliss. Though to be fair it is a particularly large 3 bed semi 🙂 . We really love it – it is like a member of our family. Other than that, life ticks on much the same. My work still is what it is (and I still can’t really make any further comment on it here!). Husband still works massively long hours out in the freezing cold most of the time. My girl is getting bigger and more gorgeous every day. We’re still on a budget. Very much so – although we got our house at a hilariously low price it is still waaaay more expensive to live here than at the flat. And everything is getting more expensive while we’re earning the same (less actually due to lack of overtime and bonuses). In spite of this, I’m making wriggle room in the budget for days out and whatever I can dream up. Life is short but the days are long. There aren’t going to be any holidays for a very long time (the last time I went away was a long weekend in winter the year before last). But days out and even the odd evening are definitely part of the master plan. Sometimes it is better spent than in the bank (don’t tell anyone I said so, right 😉 ?). That said, we’ve got some savings goals and budgets to stick to – it’s still about the balancing act!